We took the time to re-examine and optimize every feature for modern downhill skateboarding. Designed top-to-bottom for maximum function, fit, and durability! 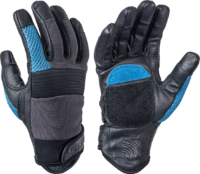 • Premium goatskin throughout, with second layer reinforcing fingertips and high-stress zones. • Goatskin on back of hand perforated for breathability and integrated with Kevlar® knuckle bar.